Shocked to realize last night that it was already Tuesday – and thus the eve of my new Local Box delivery – I cleared out the fridge last night for dinner. 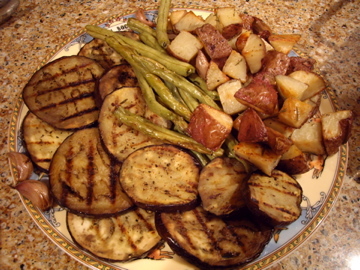 I grilled eggplant slices with olive oil, salt, and pepper on a stove-top grill pan, roasted green beans and red potatoes with rosemary, and cooked two butternut squashes I’d collected. We mashed the cooked squash with a bit of sour cream and balsamic vinegar, baked a quick batch of corn bread, and dressed some baby lettuce for a simple salad. Then I substituted Key-lime juice for a twist on Meyer Lemon Squares – and a very satisfying end to the meal. What do you still have left from last week’s Local Box?